If you’ve purchased traditional web hosting from Porkbun ( How to set up traditional cPanel web hosting), you’ll see a green icon that says "cPanel" to the right of your domain name. Click it. 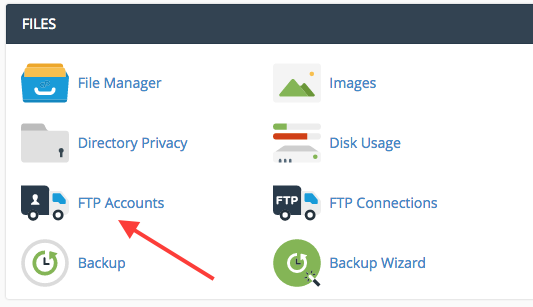 Now that you’re logged into cPanel, click the “FTP Accounts” button in the “FILES” section. 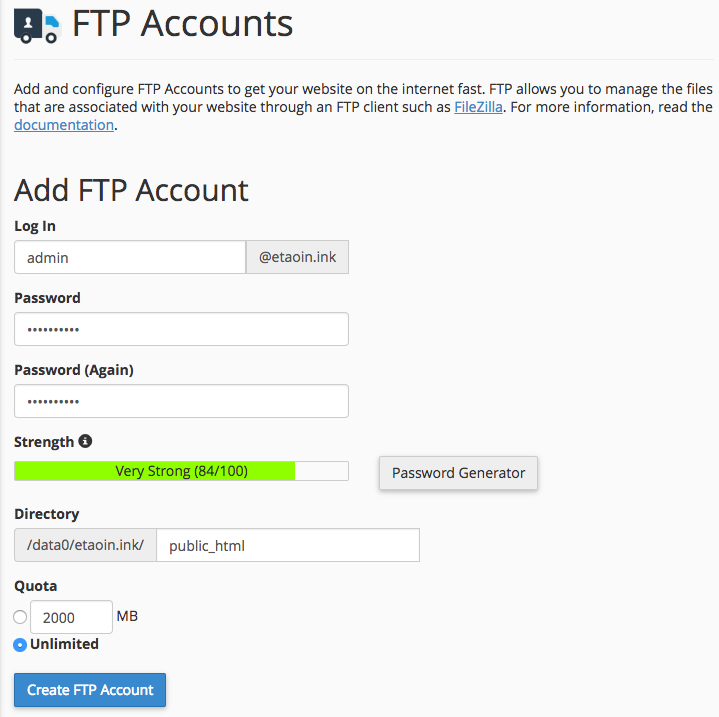 The FTP Accounts screen is where you can set up the FTP account you’ll use to manually update our website. Log In: Type the username you’ll use to log in over FTP. Some examples are: admin, webmaster, etc. Password: Type the password you wish to use for the above account. It can be the same as your account password, or different. The directory field must be set to public_html and nothing else as indicated in the above image. If you don't clear out the field and replace it with public_html then uploads won't go to the right directory and you'll have to delete the FTP account and repeat these steps. Quota: Leave “Unlimited” checked unless you need to limit the amount of data this email account can upload to your website. Once you’ve got everything looking right, click Create FTP Account to create the account. You’re now ready to log in! To retrieve your login credentials, click the gear icon or “Configure FTP Client” under FTP Accounts near the bottom of the page. Note that your FTP username is your Log In name @ your Domain. You must enter the entire FTP Username when logging in via FTP, not just the Log In name. You can simply copy and paste the FTP Username and FTP Server into your FTP client, or you can also download pre-built configuration files for your FTP client of choice in the Configuration Files section. Click the blue “FTP Configuration File” that matches your FTP client, and a configuration file will download that can be imported into your FTP client by following the linked instructions underneath the download link.